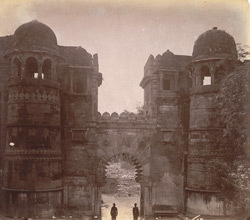 Photograph of a gateway in the Fort at Gwalior, Madhya Pradesh, taken by Bourne and Shepherd in c. 1883, from the Archaeological Survey of India Collections. Since the eighth century Gwalior has had a succession of rulers including the Rajputs, Mughals and Marathas. The city rose to prominence under the Tomars who ruled between 1398 and 1518, particularly during the reign of Raja Man Singh (r.1486-1517). The fort stands on a long, narrow, sheer-sided hill almost 100 m (300 feet) high. A long ramp on the eastern side leads up through six gates to the main entrance of the fort and the summit of the hill. Within the fort there are several palaces, temples and many water tanks. This view shows an unnamed gateway with robust round towers on either side, which could be the Badalgarh Gate, built in the 15th century but restored in 1648. It is built in the ornate style of the Man Mandir; the palace of Man Singh that dominates the eastern side of the fort.